More doctors yesterday joined the on-going strike, defying a government message to call off the job action. The doctors have been on strike since Saturday to protest poor remuneration and the deteriorating health situation in the country. “Only four out of 91 doctors came for work and I think the rest are waiting for talks between the doctors’ association and the employer over the issue of solving their problems before they report for duty,” Harare Central Hospital CEO Nyasha Masuka said. Parirenyatwa Hospital and public health institutions in Manicaland and Bulawayo faced similar situations, with Mpilo Central Hospital and United Bulawayo Hospital keeping their out patient departments closed. The Zimbabwe Hospital Doctors Association (ZHDA) yesterdya also distanced itself from utterances made by former member, Patrick Mugoni, who “represented” doctors at a meeting with the Health minister on Monday and appeared on the national televison urging doctors to go back to work. Mugoni, who was ZHDA secretary-general until a few weeks ago when he was removed from office through a vote of no confidence for being partisan, is said to have met with Health minister, Obadiah Moyo on the pretext that he was representating the association and subsequently announced that doctors should resume duties with immediate effect while their grievances have not been addressed. ZHDA said Mugoni was a bogus agent and not one of their own. “Dr Patrick Mugoni was suspended from the ZHDA after ‘crying’ while addressing the Zanu PF rally in Gweru. The ZHDA executive urges all stakeholders to ignore his utterances and any communication on the industrial action will be made through the information department,” ZHDA said in a statement. ZHDA also promised to have Mugoni examined by colleagues in the profession and to give him psychological help and counselling, if needed. Mugoni is infamous for weeping on national television after the doctors were awarded a pay hike in March. He said at the time he had been overwhelmed by emotions. Zimbabwe Nurses’ Association (Zina) secretary-general, Enock Dongo, speaking on behalf of the Health Services Board yesterday said health workers were still negotiating with government. “We are still negotiating with government, doctors are a single union that has downed tools, we appreciate that they have a genuine cause,” Dongo said. 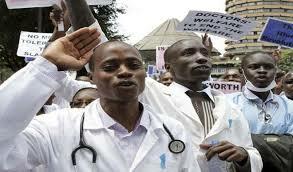 Cabinet yesterday said it did not deliberate on the issue of the doctors’ strike. “We did not discuss about the doctors’ strike because the Health minister told us that he talked to the them and that they have agreed to go back to work,” acting Information minister Mangaliso Ndlovu said yesterday. The doctors expressed concern at the Health minister’s conduct. “We wish to set the record straight that the industrial action that started on the 1st of December 2018 is still ongoing and the healthcare crisis in the country has reached an unprecedented critical level. Instead of addressing what is now perceived as a serious national health crisis, the Minister of Health seems to display an ‘I do not care’ attitude and ‘it is business as usual’ approach. “We are even greatly disturbed that the minister went on national television in the evening of (Monday) to misinform the whole nation that the ongoing industrial action has been called off. He went on to acknowledge there is a serious shortage of vital medicines in public hospitals but nothing was being done,” ZHDA said. Other stakeholders also laid into the Health minister for not handling the issue professionally. “It is shocking that the Health minister Obadiah Moyo dwells on the legality of the job action than solutions as if he is reading from his predecessor’s script. No responsible and accountable minister or government would turn a blind eye to a crisis of this magnitude or wishes it away. We are in this health crisis minister because your predecessor (David Parirenyatwa) used to behave the same way: burying his head in the sand than tackling the issue head-on,” Community Working Group on Health director Itai Rusike said. “We would like to remind the government that it has a national obligation to see that its citizens have access to quality and affordable health services as guaranteed in section 76 of the country’s Constitution. And that responsibility can only be achieved when health personnel like doctors, physicians and nurses are working normally,” Rusike said.